Cataract removal is one of the most common operations performed in the United States. It also is one of the safest and most effective types of surgery. In about 90 percent of cases, people who have cataract surgery have better vision afterward. Cataract Surgery/ Laser Cataract Surgery (Phaco/ Femtosecond Laser) are achieved by the removal of the natural lens and the placement of an implant that best fits your personal needs. There are two technologies to choose from when performing this task. There is the most common practice of phacoemulsification wherein the internal lens is emulsified with an ultrasonic handpiece and aspirated from the eye and there is also an advanced bladeless technology wherein a laser is utilized to cut the lens into small pieces prior to being aspirated from the eye. Please ask your surgeon during your consultation which method would be best for you. 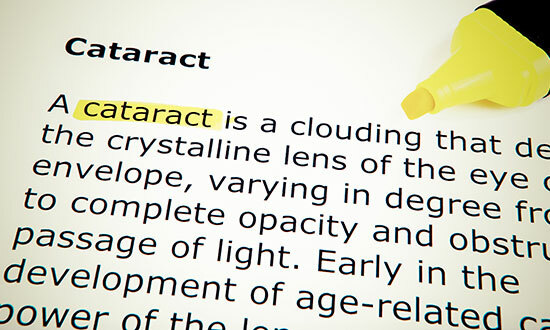 More information can be found at www.reclaimyourvision.com/cataract/cataract-surgery-options.shtml. If you were told you were not a candidate for laser vision correction due to age or early cataract, a clear lens exchange may be the refractive surgery choice for you. Our surgeons have a wealth of experience and are looking forward to helping you with your visual needs. For those desiring sharp distance vision we offer a monofocal lens implant: Alcon Acrysof IQ Aspheric IOL. For those in search for crisp correction of astigmatism at all distances we offer a premium toric lens implant: Alcon Acrysof IQ Toric Astigmatism IOL. For those seeking functional vision at all distances we offer a premium multifocal lens implant: Alcon Acrysof IQ ReSTOR.